Two years ago I had a go at making up my own crochet version of the Jayne Cobb hat in response to a hat making request from Kim Werker at Crochet Me. For those of you who don't know who the heck Jayne Cobb is then I highly recommend that you go out and borrow a copy of the Firefly series or the film Serenity. 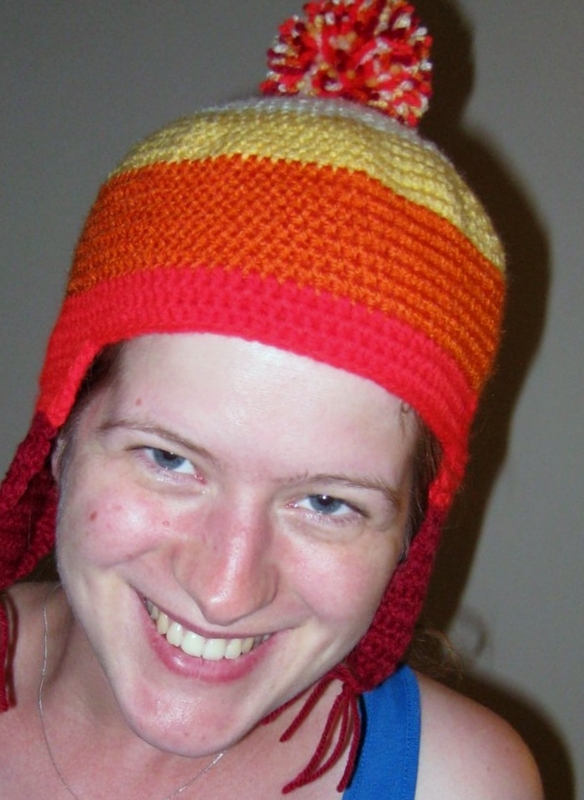 Now two years later on I've had a request to publish the pattern I wrote for this hat so I'm going back to my roughly scrawled notes to try and piece a basic pattern together for them and anyone else who is interested. However, there are a few other much better crochet patterns out there as well as a good number of knitted patterns too so be sure to do a Ravelry search to help you decide which pattern you want to use. I forgot to measure my hat before I sent it off to my sister but as it fitted me it was probably a size small. You may need to adjust the number of increase rows you work in the crown to get a perfect fit. if you want a smaller or larger hat then either work a row or two less or do a row or two more of the increase rows. Make up a nice big pompom for the top using all three of the yarn colours and stitch it on to the top of the hat. Sew in any loose ends and you're done!